Last week I was a free woman. No school, no homework, no late night projects, no running to Michaels Arts and Crafts to buy poster boards…I was a free and it felt SO nice! Today that freedom is coming to an end, except for this time, instead of making late night runs to the arts and crafts store, I’ll be refilling the lead in my mechanical pencil, tearing out dozens of scratch papers and dialing in equations on my calculator. Yes, dreadfully, I begin my quest to conquer my worst nightmare…MATH. You look stunning! Love your top and sunglasses! Math is also my nightmare. In college, I kept putting them off because I struggle with it. My last semester ended up being full of math 1030, statistics, and research methods. It was awful! This is such a pretty simple outfit, love those heels! Love your outfit – so cute yet simple. :) I despise math…ugh. Good luck! Math is so much fun…..SIKE! Super cute outfit. I love your sunnies. I love the high low top! I am terrible at math so I wish you the best of luck! Love this outfit – so chic for a night out! 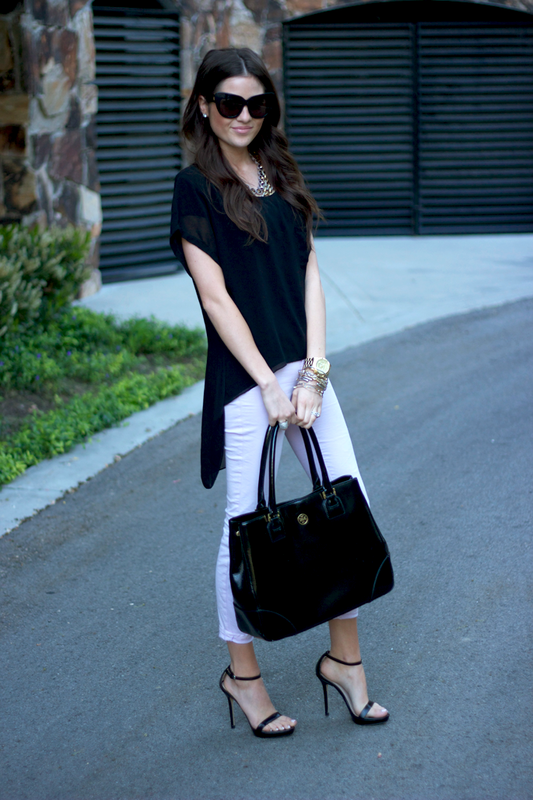 love the simplicity of this outfit – it’s chic, yet sophisticated! Love it. Good luck with math!! So simple but gorgeous…I want these heels too, they’re so stunning!!!!! Best of luck with math! You can do it! Obsessed with tops with that cut. Lovely outfit! I love that top, so cute! Good luck with math! Good luck Rach! I also was a disaster in Maths! At least you’ll look gorgeous!! you look amazing in this outfit! love it. so simple but so chic. Gorgeous outfit Rachel!! Love this post :) Good luck with spring semester! LOVE this on you, so simple and chic. That top is beautiful! Love your outfit! :) Cute heels! Good luck lady! You can do it! Love your pretty asymmetrical top! Oh my goodness, I will say a prayer for you – I am awful at math! :( Love this outfit…I have a hi-low skirt, but now think I need the shirt version, too! 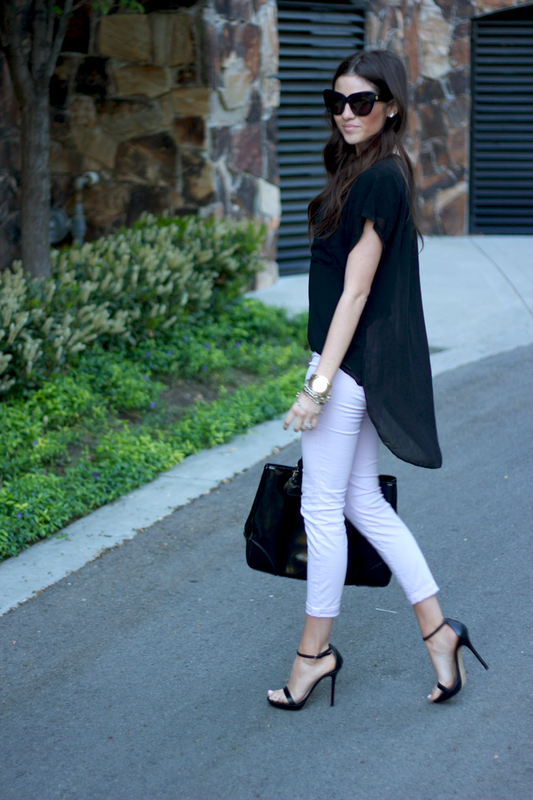 This look is so chic, love the black and white and the asymmetrical hem on the top. Normally I’m not a huge fan of high-low tops but you made it look so good! Love it! Good luck on math! I love the top – perfect! Oh I know exactly how you feel. I’m in the middle of law exams in the process of finishing my law degree. It’s not easy but we’ll get through!!! Best of luck. Oh love this outfit hon! 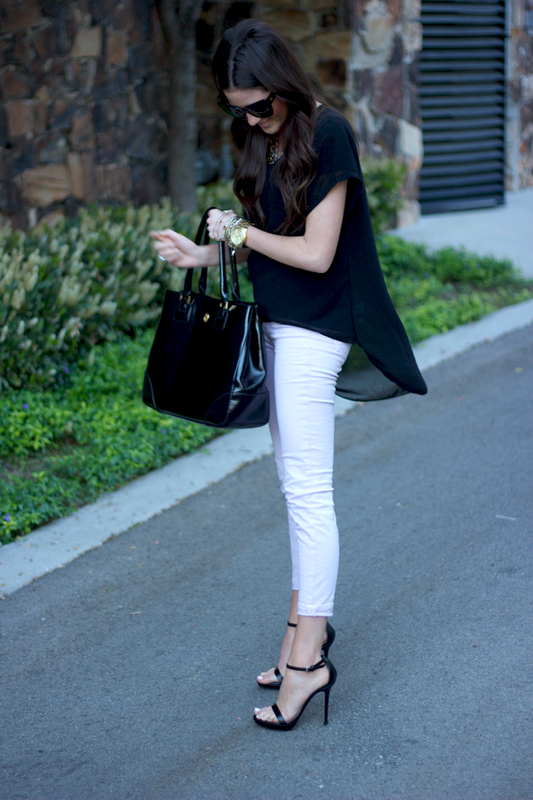 Love monochromatic outfit. Looking so pretty. It feels so good to be done with exams and homework for the next few months. Every outfit you put together seems to be perfect! I love the simplicity of this, very Jackie O! ugh math :/…love this outfit! you look lovely…. but math sounds gross! Good luck lady! what a wonderful play with length, this top is asome! I am in love with your “wrist wear”. So beautiful. Good luck with MATH!! Girl math was the worst for me in school. Not because I couldn’t do it, but because I wasn’t interested! Your look is really nice!!! I love it!!! pls visit my blog if you want… lot of love!!! Loving the oversized cat eye! I LOVE this outfit! That top is perfect and those shoes are gorgeous! Sensational look. As Caroline Herrera so aptly put it, “less is more”. You took a neutral base and gave it your own elegant style with accessories. Absolutely love it. PS I just got through with math…and I hate it. I never felt so frustrated in my entire life! Good luck! Just take it easy and you’ll see it’ll be alright! i love the cut of this top, gorgeous! Great look! That top is so beautiful. Loving the simple cool vibe of this outfit. This is so classic! Modern-day Audrey Hepburn meets Jackie-O. Probably one of my favs! wow i just found your blog. your photos and outfits are amazing!!! Loving your hair in this post. Please do a tutorial on how to get those effortless loose curls. I’m loving it! I absolutely love this outfit! I’m so sad they are out of stock on the top!